Some of our favorite recipes use basil. Tomato and basil recipes are probably the most common. The flavor combination of fresh tomatoes and fresh, sweet basil is hard to beat. 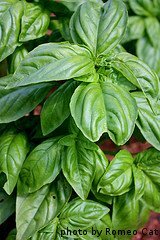 However, basil can be served raw in salads or garnishes or used to season just about every variety of meat, poultry, fish or vegetable. It is also the main ingredient in classic pesto recipes. Basil can also be used to add flavorings to butter, mayonnaise, dressings or tea. Today, some innovative chefs are even using basil to flavor ice cream. Heat olive oil in a large pot over medium heat. Add garlic and saute for 2 minutes. Add diced tomatoes and tomato juice to the pot and simmer for 30 minutes over medium heat. Add the tomato mixture, basil and oregano to a blender or food processor. Puree until smooth and return the mixture to the pot over medium-low heat. Stir in the half-n-half, butter, salt and pepper. Continue stirring until the butter is melted. Serve immediately. Combine basil, garlic, Parmesan cheese, salt, pine nuts and parsley into a food processor. Pulse until finely chopped. Pour in lemon juice and olive oil and blend into a smooth paste. For different flavor variations, use toasted walnuts, almonds or hazelnuts instead of pine nuts. Alternate varieties of basil such as lemon or purple ruffle can also be used to change the flavor to suit your liking. To a food processor, add basil leaves and chop them up. Add butter, lemon juice, garlic, salt and black pepper. Blend until smooth. Keeps in refrigerator for up to 2 weeks. Use butter on toasted french bread or as a substitute for regular butter when cooking. In a food processor, chop basil and sun-dried tomatoes. Add mayonnaise, red wine vinegar and olive oil and blend until smooth. Store in refrigerator for up to 4 weeks. Add all ingredients to a medium bowl. Whisk vigorously for 1 minute until well combined. Use as a salad dressing or marinade for fish, poultry or vegetables. Store leftovers in the refrigerator for up to 2 weeks. Place the sliced tomatoes in a mesh strainer. Sprinkle with salt and let sit for 10 minutes. Much of the liquid will be released. In a small bowl, combine the onion, basil, black pepper, olives and mushrooms. Drizzle with olive oil and toss gently to combine. To a small bowl, add the tomato sauce, oregano and red pepper flakes. Stir well to combine. Spread the tomato sauce evenly over the two pizza crusts. Distribute the onion and mushroom mixture evenly over each pizza. Sprinkle each pizza with 4 oz mozzarella cheese. Layer the sliced tomatoes over the cheese on each pizza. Top the tomatoes with the remaining 8 oz of mozzarella cheese and Parmesan cheese. Bake the pizzas in the preheated oven for 8-10 minutes, or until the cheese is melted completely. Serve immediately. Slice Italian sausages in half lengthwise. Cook in a skillet over medium heat until browned and cooked through. Set aside. In a large pot, cook the ground beef, onion and garlic over medium heat until the meat is well browned. Drain mixture and return to the pot. Stir in crushed tomatoes, tomato paste, tomato sauce and water. Add in sugar, fennel seeds, oregano, salt and pepper. Mix well. Cover and simmer over medium-low heat for 1 hour, stirring occasionally. Fill a large pot with hot tap water and place noodles into the water. Cover and let sit until ready to use. In a small bowl, stir together ricotta cheese, egg and parsley until well combined. To assemble the lasagna, spread 1 1/2 cups of the meat sauce into the bottom of a 9x13 inch baking dish. Place 6 lasagna noodles over the meat sauce. Spread with half of the ricotta cheese mixture. Spoon 1 1/2 cups of the meat mixture over the ricotta cheese. Top with 1/4 cup Parmesan cheese and 1/4 of the mozzarella slices. Add another layer of lasagna noodles. Cover the second layer of noodles with the sweet sausage slices, cut side up. Layer the basil leaves over the sweet sausage. Top the basil leaves with 1/4 of the mozzarella cheese slices. Add another layer of lasagna noodles. Top with remaining ricotta cheese mixture. Add another layer of meat sauce and sprinkle with 1/4 cup Parmesan cheese. Layer on 1/4 of the mozzarella cheese slices. Top with remaining lasagna noodles. Layer remaining slices of mozzarella cheese on top of the noodles and sprinkle with remaining 1/4 cup of Parmesan cheese. Cover the lasagna with foil and bake in preheated oven for 30 minutes. Remove the foil and bake an additional 25 minutes, or until the cheese on top is browned and bubbly. Let cool 10 minutes before slicing and serving.